I haven't had a chance to post my pictures for a couple of days. It was a whirlwind tour and it's been a whirlwind since, but I have a few minutes to breathe as I wait to pick up a friend at the airport on a frosty clear fall morning. 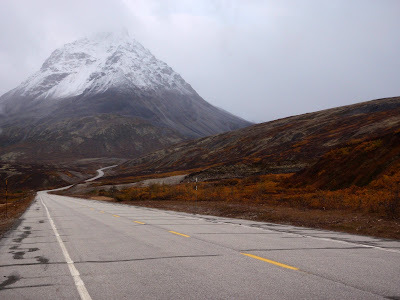 The Golden Circle, which is actually shaped more like a broken triangle, is a 370-mile route of connecting roads between Haines and Skagway, Alaska, two towns that are geographically only about 20 miles apart. I'd done the ride twice before, once in each direction, and this year invited my friend John from Connecticut to join me on what is becoming my annual fall tour. He was able to secure a tight window before a business trip and scheduled the six connecting flights it takes to get here from the East Coast. We were on the ferry within hours of his arrival. 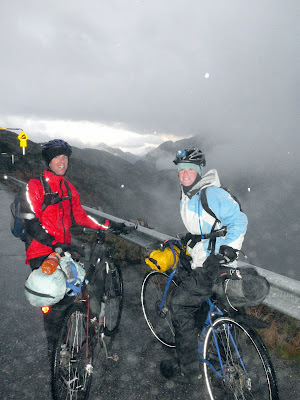 I was apprehensive about this trip because it really is a long distance, with climbing, to cover in three days on a loaded bike. In the past, I've trained specifically for this trip. This year, my late-summer riding has been limited between recovery from the Tour Divide, followed by heavy focus on hiking. 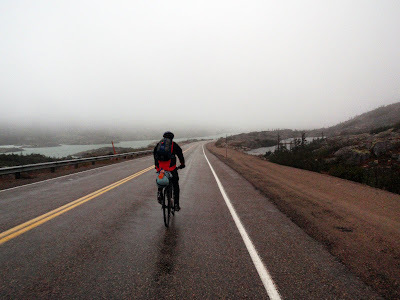 Sure enough, my biking-specific muscles, namely my quads and lower back, started to feel sore before we even crossed into Canada. But the weather was much nicer than expected - cloudy and only light sprinkles instead of the anticipated 40 degrees and pouring. In the rush and confusion of packing late the night before, I had basically brought enough gear for an Arctic expedition. I guess I decided that what I lacked in muscle strength, I'd make up for in sheer bulk. 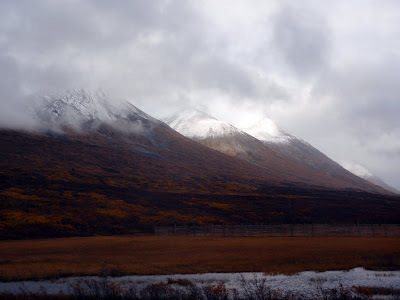 It was a nice security blanket to have as we chugged toward Haines Highway Summit, however. 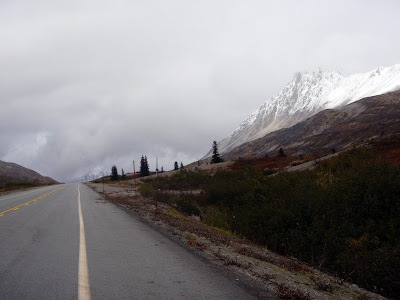 The Canadian border guard issued us a dire warning about snow at the pass and certain death to all who chose to cycle through. 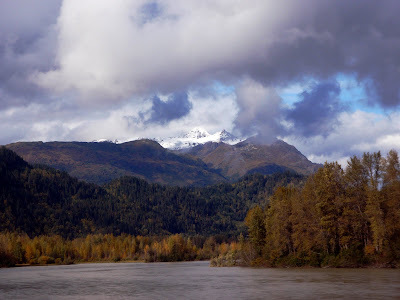 Snow swirled through the clouds surrounding us, but never hit us directly. 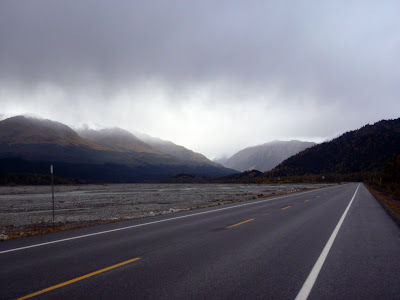 I've ridden the Haines Highway more than a mountain-bike owner who has to endure a three-to-five-hour boat ride to get here probably should. It still takes my breath away every time. 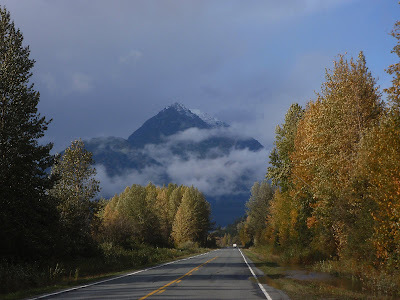 Day one was a 160-mile leg between Haines and Haines Junction, on top of a four-mile early-morning ride to get to the ferry terminal. Due to a less-than-ideal ferry schedule, we weren't on the road until after 11 a.m. I had braced myself for a 1 a.m. or later arrival into Haines Junction, but a forceful tailwind pushed us north. I knew we'd have to pay for that prevailing wind in the next two days, but it sure made the first day go smooth. 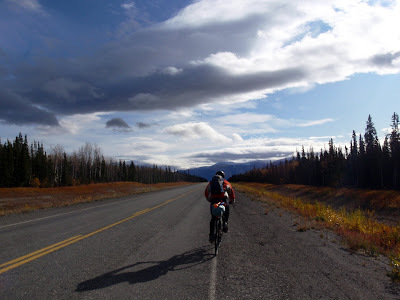 We coasted into Haines Junction at 9:30 p.m. Alaska time, headlights reaching out into a cool, traffic-free night. 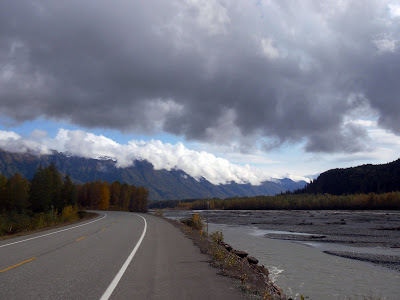 I'm practically useless in the morning, and I haven't yet convinced John that I'm slow enough to require a full day to ride a century, so we lazed around Haines Junction, had a huge breakfast, and weren't on the road again until after 11 a.m. Friday. 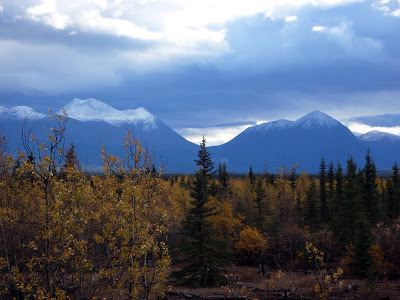 It was a beautiful day on the Alaska Highway. 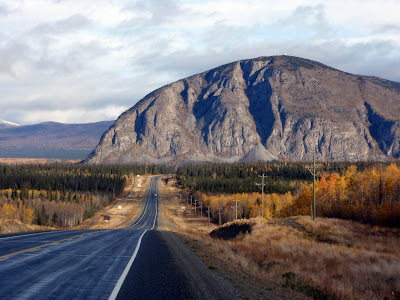 The 100 miles between Haines Junction and Whitehorse on the Al-Can is generally considered to be a "connector," a necessary chore to pound out between the Coastal Mountain legs. But for not being very "scenic," it sure is pretty. Despite our late start, we still stopped for a long lunch. We're on vacation, after all. Our beautiful tailwind from the day before shifted just enough to become a 15-20 mph headwind, blasting our faces as we churned through chip-seal on our way into Whitehorse. We still made it by sunset. My friends Jenn and Ben cooked up a massive pasta dinner, and we kicked back and mostly talked about mountain biking. 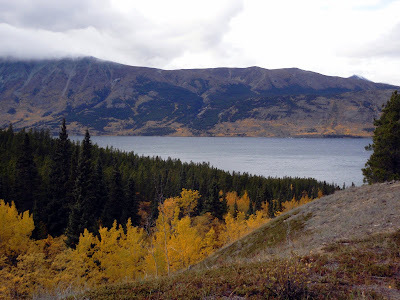 After two days of solid daylong effort, my quads felt like they had been pounded by a meat tenderizer, and Sierra's descriptions of Carcross trails and her new massive downhill bike were so tempting. We were facing 110 miles of solid headwinds and climbing the following day, but if we gave into temptation, Sierra was willing to shuttle us 50 miles in exchange for a few hours of hucking on dry autumn trails. I asked John if he was dead-set on riding the whole loop since he hadn't done it before. When he said he didn't care, Sierra and I set up the shuttle. We got up late in the morning again and rode 25 miles out of town. 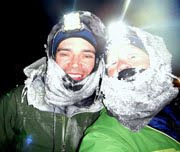 Sure enough, the headwind had strengthened to a deafening roar, and my legs felt like mush. Sierra and Jenn rolled by in a truck loaded with squishy mountain bikes, and I was so thrilled to see them. We were on vacation, after all. We headed up high to blast down the Carcross trail system, one of only a handful of trails I've ridden in my life that were specifically built for mountain bikes. I'm so used to riding gravel roads and choppy hiking trails that riding singletrack with that much effortless flow is an almost transcendent experience. It put my mushy legs and the hard southeast headwind far, far out of my mind. 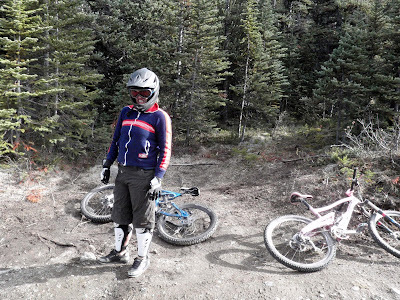 Sierra bought an A-line downhill bike as a gift to herself for recently completing an Ironman. 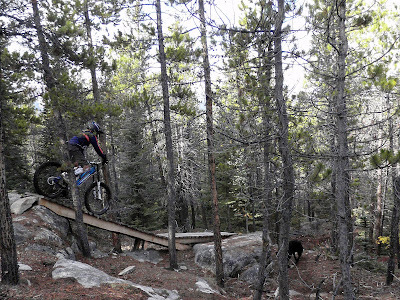 Not only is she an Ironwoman, she's also pretty fearless on big bikes. I borrowed her all-pink mountain bike - Sheera, the Princess of Power. It convinced me that my next new bike is almost certainly going to be full-suspension. We rode over railroad ties and it felt like floating on pillows. 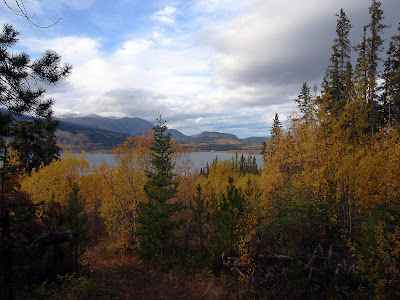 The trails at Carcross are fairly new and still limited, but this place seems to have the potential of becoming the mountain biking destination of the north - for Canadians, at least. The scenery isn't too shabby, either. After our ride, Sierra and Jenn shuttled John and me and our suddenly-pathetic-looking touring bikes several more miles south, dropping us off about 30 miles from Skagway, and 15 miles below White Pass. We churned our way to the alpine, where the southeast wind blew with spectacular stopping power. For me, fatigue set in hard. Even my downhill biking muscles - namely the fingers I use to squeeze the brake levers - were sore. 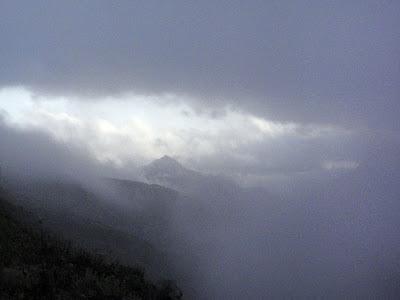 We crested White Pass in a light rain storm and fog, with temperatures in the high 30s. 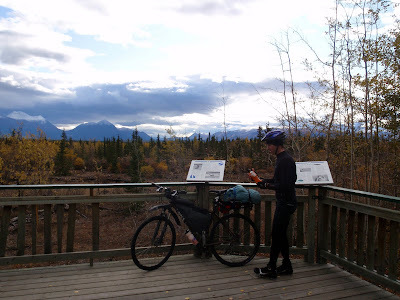 In preparation for the wet descent, which loses 3,300 feet of elevation over a mere 14 miles, I finally put on all the Arctic gear I had so dutifully dragged for 300-plus miles. Overall, it was a super fun trip. I think John would agree. 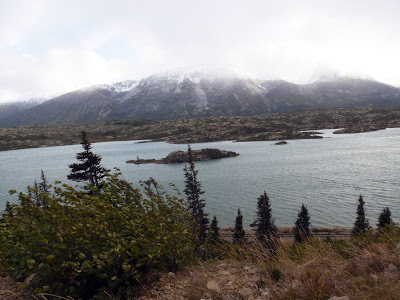 We were into Skagway by sunset, stoking our inner furnaces with spicy Thai food that night, and back on the ferry by the next morning. Maybe next September I will do something different, but there's something to be said about autumn traditions. Soooo...that explains the big blank section on your Spot page! Sounds like a fair solution to me. 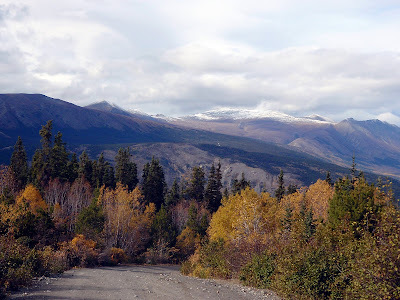 I'm all for autumn traditions, and one of my favorites is reading your account of The Golden Circle. Love the pics. Thanks for posting. Wonderful for us armchair travelers. Wonder how many cars did you see out there? It can be so desolate. Great ride! It amuses me to consider what you think of as a vacation! I love reading your blog and admiring all the scenic pictures. It's definitely a vicarious thrill from the comfort of a dry, warm home. Not to sound sappy, but I really do admire you and the passion you have for the outdoors. It makes me wish that I was still living in northern Minnesota and not here in the Twin Cities. Some of us are slaves to our jobs. That troubles more and more as I get older and older. I regret not being more adventurous at a younger age. like the autumn photos you posted, and it's really a wonderful biking trip. 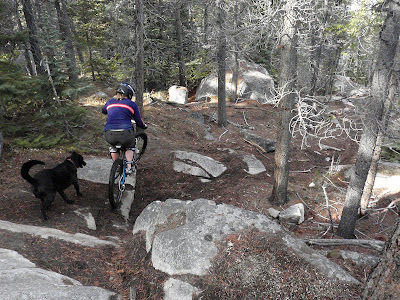 Also "riding singletrack with that much effortless flow" showed your transcendent skill.